Skyscanner - helps millions of users a month find the cheapest flights around the world by searching over 600 airlines – budget and scheduled – and 6000 routes. Publishers can also expect high conversions due to Skyscanner’s simple, easy to use search engine that has made it such a firm favourite with users and the media – Skyscanner is constantly recommended by national print, online and broadcast journalists. Skyscanner is one of the fastest growing online travel sites in Europe. Cheapest flight prices, ease of use and clever search tools have made it a firm favourite with travellers and the media. Travel is one of the highest spending priorities for web consumers. Earn more from your site with Skyscanner, Europe’s favourite flight search site. These tools have now been captured in a unique range of banner and panel creatives for you to choose from, with functionality that isn’t available anywhere else. With Skyscanner you can now show your visitors search controls, flight prices, route maps and airline options without them even having to leave your site. Publishers get a massive 60% revenue share. This normally means a payout to you of between 7 and 30 pence with an average of 13 pence. However individual payments can be up to £1.00. SmartFares - is an online travel reservations service that specializes in cheap flights and discounted airline tickets to the top travel destinations within the United States and the World. Now start traveling without any deadline and enjoy exploring your favorite destination with our splendid one way flight sale. Whether you are planning a long business trip or have a dream to explore the city to its full extent, our wide range of one-way flight deals will help you to enjoy your dream destination for as much time as you need without being stuck with a return date. Covering the most renowned destinations across the globe, our bewitching airfares will help you to start pouring in savings whilst giving you the liberty to be at your dream destination as much time as you need. Earn up to $18.00 per sale. You can incorporate a SmartFares Cheap Flights Bookings Panel into your site to generate more sales. SPENT Travel - is the best new way to book hotel rooms with huge cash back of up to 45% (or averaging 25%) at your favorite big and boutique brands. A simple, fast and secure booking engine and app that enables you to tally up your cash for travel trips. SPENT Travel has over 300,000 unique hotels, in 200 countries worldwide. We offer the most comprehensive selection of hotels globally, prices are always equal to other leading OTAs and cash back makes it a winner deal for users. Earn 5% commission for each hotel booking that becomes a completed stay. Bookings are tracked by pixel and reported once the reservation is made. Completed stays are batched once a day for the previous day's completed stays. No commission is attributed to the booking until it is confirmed as a completed stay. Splendia - is a major online distributor of boutique & luxury hotels. Splendia has an amazing selection of high-end luxury and boutique hotels all over the world. With a 2,500 hotels portfolio in more than 100 destinations, Splendia is one of the major brand specialized in online luxury hotels distribution. Created in 2004, Splendia has over 500,000 clients from Europe, Americas and Asia. Our clients benefit from best price guarantee, exclusive benefits (including rewards on their next purchase) and personalized customer service. Recently bought by Voyage Privé Group, Splendia has the means to achieve its targets. Let’s grow our businesses together offering our customers a curated selection of exceptional hotels, with best price guarantee and exclusive benefits. Earn a 5% commission on every consumed booking (after check-in). Don’t miss the special Summer promotion: 6.5% instead of 5% commission until September 30th. Stansted Express - Become a publisher of Stanstedexpress.com and earn commission on train ticket sales! As a publisher of Stanstedexpress.com your customers will have access to all fares across the Stansted Express route and beyond. Central London to Stansted Airport in just 47 minutes Group fares start at just £7 pp one way. Join today and earn up to 3% commission. Sunrise Direct - Choose from over 95 free local departure points. There are few holiday companies in Britain that can claim such a long and distinguished history as SunriseDirect. Needless to say we are very proud of our past and, of course, our East Anglian roots. For decades we’ve been totally committed to providing local people with a truly unbeatable holiday service, and our network of local departure points across Norfolk, Suffolk, Cambridgeshire and Essex is an important part of that rich heritage. Unlike many other companies, SunriseDirect is focused on the East of England, and we know the region like the back of our hand. Journey’s are often swifter because of that special knowledge, and that often means you will be relaxing at your destination while customers with other companies are still on the road! We are offering 5.00 % CPA on valid sale. Sunshine.co.uk - is the holiday website designed by affiliates for affiliates. Taking our knowledge of having been affilliates ourselves, we created sunshine.co.uk to be the best affiliate programme for travel and non-travel affiliates alike. The big idea behind sunshine was a simple one. If low-cost airlines can work, so can a low-cost travel agent. We started sunshine.co.uk so we can sell amazing holidays as cheaply as possible. We cut the costs by only selling holidays online (and passing on the savings to you). And instead of expensive advertising, we look after our customers so well that word-of-mouth does the rest. That's why we have thousands of happy customers and can guarantee that any holiday you book with sunshine.co.uk will be the lowest possible price. We don't have a call centre, so no leakage through telephone sales. Any bookings requiring telephone intervention are also tracked to the affiliate who generated the booking.Standard Commission Rates: Hotel Only Booking - 6% per booking; Flight+Hotel Booking - 5% per booking. Cashback Affiliates: Hotel Only Booking - 1% per booking; Flight+Hotel Booking - 1% per booking. Suntransfers - is the low-cost leading transfer company, providing a wide choice of services and destinations operated from more than 500 airports and travel gateways worldwide. We offer a wide range of vehicle types such as taxis, minibuses, minivans and coaches and different vehicle categories such as our great value standard service, plus premium and VIP options. Our multilingual customer support team is on hand to offer global sales support and travel assistance 24 hours a day, 365 days a year for all aspects of our service. Suntransfers.com is trusted by millions of customers and rated Nº1 on Reviewcentre.com. The suntransfers.com program allows your site visitors to browse suntransfers.com, the online hub for one of the global leaders in holiday transfers. The company’s extensive fleet of economic, luxury, and specialty vehicles helps travelers get to and from hundreds of airports and other destinations throughout the world. We are offering you the opportunity to make money with the world’s best-known and respected travel brand. It’s easy! Just by linking your website to ours you can earn commission whenever your customers book on Sunstransfers.com through your website. Sales are tracked automatically, by giving you a unique tracking link to track sales made via your website, we will pay you a percentage of every booking made. Not only that, but thanks to our 30 day cookie we will also pay you if your customers book direct on Sunstransfers.com within 30 days of the original referral! Your commissions are paid automatically into your bank account, so it’s a straightforward way to make money from your site. Earn 10% commission for each Suntransfers.com per completed sale. Superbreak - is the number 1 short breaks tour operator in Britain. Superbreak specialise in booking 2-5 star hotels throughout Britain & Europe and theatre breaks for London’s top West End Shows. Superbreak hold extensive allocations of rooms at over 3,500 hotels. Customers can book up to the day before their stay begins online. It is possible to book a hotel on Superbreak in just 3 clicks providing excellent conversion. In addition to instant online confirmation, every customer who makes an online booking receives confirmation in the post for extra peace of mind. More than 1 million customers travel with us every year. Superbreak's key programme strengths are excellent availability, daily updated special offers and a wide choice of hotels in key UK and European destinations such as London, York, Edinburgh, Prague and Amsterdam. Airport hotels are also a consistently strong seller as is the theatre break programme. Earn 5% commission on hotels and 5.5% on any theatre break bookings (hotel & theatre package). A typical Superbreak booking is a 2 night stay in the UK and Europe, worth approximately £170. A theatre break booking has a higher transaction value. SWISS - is Switzerland’s best known airline and serves 73 destinations around the world with its 85- aircraft fleet. SWISS is part of the Lufthansa Group and a member of the global Star Alliance and is known as a quality airline. SWISS wants its guest to feel at home. And, with its core values of “personal care”, “Swiss hospitality” and “quality in every detail” , SWISS will continue to maintain its high market profile as Switzerland’s national airline. Online bookings on swiss.com include Miles&More miles, all inclusive fares and service on board free of charge. Commission : £4.00 GBP on Item List: Shorthaul; £6.50 GBP on Item List: Longhaul; £8.00 GBP on Item List: Business Class. This is an example of how SWISS Online Ticket Booking panels can be built into your site. TakeTours - GotoBus partner, TakeTours, has launched as a new dedicated tour and vacation booking service. With TakeTours.com, customers can browse, compare, and purchase tours from all over the world. Users can enjoy the same look, feel, and functionality of GotoBus.com. While GotoBus affiliates can earn TakeTours commissions automatically! With a combined affiliate program, earnings from GotoBus and TakeTours are combined into one easy to use account! So what are you waiting for? Use your same GotoBus affiliate login and password to access your TakeTours account. Special TakeTours links are available in the tools section. Earn 4-5% on all bookings! Taxi2Airport.com - is one of the world's largest ground transportation technology platform. With over 100,000 destinations worldwide, and active in +85 countries, Taxi2Airport.com gives leisure and business travelers access to the widest selection of airports, train stations, ports and hotel/accommodations. How much can you earn? The sky is the limit! This commission structure is based on the number of consumed rides and is tiered between 4% to 7%. Thistle Hotels - is a leading hotel chain that really needs no introduction! This merchant is currently investing in a £100 million transformation, upgrading every one of its 32 properties, so there’s never been a better time to add this widely recognised brand to your promotions! Thistle Hotels can be found throughout England, Wales and Scotland in every major city and regional centre, with 9 hotels in central London alone. Thistle Hotels offers 6% commission on all bookings. The Thomas Cook Group - is the oldest and best known name in leisure travel with a history of innovation that started in 1841. We are very proud to serve the 19 million customers who chose to travel with us each year and, are focused on transforming our business so that we can serve even more customers in ways that deliver better their holiday dreams. Thomas Cook's own Hotels & Resorts are here to bring you unforgettable holiday experiences. Each type has its own personality, so you're bound to find the perfect one for you. There's our luxurious SENTIDO Hotels & Resorts, our fresh look smartline Hotels, the digital features of our SunConnect Resorts, our adult-only Sunprime Hotels and our fun-filled Sunwing Family Resorts. Plus, there's the laid-back luxury of our boutique-style Casa Cook Hotels and our new generation of Cooks Club hotels to enjoy. With options to suit every taste and budget, whether you're travelling on your own, as a couple or with your family, you'll have a holiday to remember with Thomas Cook Hotels & Resorts.me and expense. We take professional photos, design floor plans, and record high-definition videos of the property and neighbourhood. We also write detailed descriptions about the home and local area. For an experience which feels even more personal to you, pick the perfect place to stay with Choose Your Room, before you set off. There's also the option to Choose Your Favourite Sunbed, meaning you can relax in the mornings for the whole of your holiday, knowing your chosen sunbed is reserved just for you. Earn 1.5% commission on sales. Thomson Holidays - offers access to great value holidays, direct from the UK's No1 supplier of air inclusive package holidays. With the widest range of holidays available, all linked to the most punctual charter airline, your users are bound to find the perfect holiday. More satisfied holidaymakers come back to Thomson than any other holiday company - why choose anybody else? Thomson offers 1.5% commission on all holiday bookings. Top of the Mountain at Sun Peaks Resort - Get steep discounts on your accommodations and get commissions by referring people to Top of the Mountain at Sun Peaks Resort. If you know people who like to ski, snowboard, golf, fish or mountain bike and are willing to refer them to book through Top of the Mountain Accommodations, we would be delighted to offer you several benefits to make it worth your while. Refer people who like to ski, snowboard, golf, fish or mountain bike and save 10% to 25% off your own accommodations! Get paid 10% commission on your referral's bookings and 5% commission when your referrals refer others! Offer your referrals a 10% discount to encourage them to book, and you can even "kickback" your commission so they can save 20% on their bookings! Commissions are paid out between 30 to 45 days after a referral has checked out from the rented accommodation. During the Christmas and New Years season, it's not uncommon for people to spend more than $3,000 on accommodations at a luxury condo or chalet with a hot tub, so a single referral could be worth over $300.00 to you for simply posting a link on your website. TopView Sightseeing - Earn Money with the TopView Sightseeing Advertising Program. Become a member of the TopView Sightseeing Advertising Program and you'll have the opportunity to earn money while showcasing a well-known and trusted brand! Join the fastest growing sightseeing brand in New York City! Our Brands Include: TopViewNYC.com, BikeRentalCentralPark.com, LibertyCruise.NYC. Earn 20% Commission on Sales. Tours4fun - is a thriving online travel agency for quality travel suppliers to sell their services, dedicated to the ideal of providing the finest online purchasing experience for all your travel needs. Tours4fun strives to make itself the ultimate online superstore for tours with the widest selection and best prices. Tours4fun guarantee that you will enjoy premier quality services. Tours4fun always believe that they are not merely showing new places to fellow customers, but actually extending their knowledge of different ethnic cultures to customers. The development of the understanding and accepting of all different ethic cultures on the planet earth will, in their eyes, allow us to live in peace and harmony. Looking for the hottest tour products at the best value? Tours4fun's current products include tours and vacation packages in Hawaii and Florida states as well as in the dynamic cities along the US East and West Coasts. Earn 5% commission on sales. Travelation - is a leading travel website specializing in cheap flights, discount hotel rooms, cheap car rentals and wholesale cruises to the top travel destinations within the United States and across the World. Travelation has direct agreements with the world’s leading airlines to provide the cheapest airfare deals to our customers. In addition, Travelation works directly with a large number of airlines to offer specially negotiated fares that provide an additional source of inexpensive airfare options for our customers. Whether you are looking for cheap flights, cheap airline tickets, want to rent a car or book a hotel, you can do it all together on Travelation. With more low-cost airline tickets, more cheap flights, more great deals and with our best price guarantee, you get what you are looking for. To assist you more and save time, we have great customer support. Our expert travel agents are available 24*7 to help you get the best deal for your preferred travel date and time. And do not forget to call if you want to get the lowest airfare on last minute trip. Earn up to $11 per sale on flights, $18 per sale on hotels, $8 per sale on insurance and up to $5 per sale on car hire. TravelPayouts - provides 2 cool services: JetRadar.com and Hotellook.com. They can help travelers to find cheapest airplane tickets and hotel rooms. We pay up to 70% of our profit. Travelpayouts is among top rated CPA travel affiliate programs dedicated majorly for travel bloggers, travel websites, travel agencies and even individual travellers (travel cashback). Affiliates make stable income from selling flight and hotel bookings and other travel services. The Travel payouts cover the whole range of travel services such as flights, hotels, car rentals, insurance, transfers and even more. They also help a traveler to organize a vacation and increase your earnings. Affiliates earn $7.5 average from each airline ticket sold and $20 average from each hotel reservation. Affiliates earn 5% of our income generated by their referrals. Travel Reservations System - from TravelStoreMmaker. By joining our Affiliate Program any website or portal is able to integrate a one-stop location for their visitors to purchase travel services, maximizing their earning potential. TravelStoremaker.com branding technology allows you to create a company branded travel site that will enhance your site content and launch you into the significant and growing internet travel marketplace. Your visitors will have access to extremely competitive air fares. TravelStoreMaker.com's Internet Booking Engine (IBE) uses GDS published air fares, specially discounted consolidator air fares and low cost carrier air fares. By using our IBE you will receive higher level of customer satisfaction and be positioned to respond to a competitive market demand for universal travel solutions offering the maximum options for flight, car and hotel bookings. You will attract and retain visitors with the ability to search and compare special fares and rates, plan and book flights, hotel rooms and rental cars online. The content, currently available in the TravelStoreMaker.com IBE, consists of 455 airlines (including over 100 Low cost carriers), 45 of the biggest hotel providers (Booking.com, GTA, GoGlobal, Travco, etc) managing over 80,000 properties and one of the biggest global car rental providers with over 18,000 locations worldwide. Competitive compensation scheme - $4.00 per passenger for reservations using published air fares and for low cost carrier air fares; $5.00 per passenger for reservations using consolidator fares; $10.00 for flight+hotel dynamically packaged reservations; 5% of the net rate of sold and paid for hotel booking; 5% of the net rate per sold and paid for car booking. Multilingual Internet Booking engine. Travelocity - the leading online travel Web site, provides reservations capabilities for 95 percent of all airline seats sold, more than 47,000 hotels, more than 50 car rental companies and more than 5,000 vacation and cruise packages. Earn $2.00 per ticket and $1.00 for every car and hotel reservation sold. Check out the Travelocity holiday booking shopfront. Travel Visa Pro & US Passports - Travel visa pro offers online us passport (new, renew, name change) and travel visa (Russian, Chinese, Brazil visa) services. Are you traveling into unknown territory? Then you came to the right place. Travel Visa Pro gets you through the red tape quickly, securely, easily, and safely. Travel Visa Pro provides one-stop solution to all of your travel visa and US passport needs. Travel visa pro have been providing responsive visa expediting services to CHINA, BRAZIL, INDIA, RUSSIA, VIETNAM, and 200+ other countries for over 7 years. Travel visa pro are used to working within very tight deadlines and with missing documentation. Customers rely on Travel visa pro to get to their destinations on time and with perfect travel paperwork and Travel visa pro deliver just that. Affiliates earn up to 10-30% per sale for all new and returning customers for life. Trip Myanmar - With the introduction of eVisa facility in Myanmar, the tourism industry of the country is all set to face a transformation. The number of travelers visiting Myanmar are expected to increase to a greater extend in coming years. Keeping this shift in mind, Trip Myanmar is intentionally created to make the visa process simple. We have well-trained customer support executives who have in-depth knowledge and years of experience in the field, which helps our valuable- customers to get their visa application approved within 48 hours. Earn $15.00 Per Sale. TripAdvisor Payout on Booking Engine Click - Enhance your site and content with the TripAdvisor Affiliate Program. By becoming an affiliate partner, you can link to the world’s largest travel site with over 500 million reviews and help your users find the lowest hotel prices with TripAdvisor’s price comparison of over 200 hotel sites. No hotel booking required for a commission. Earn commissions on each click to the booking engines (Expedia, Booking.com etc). Two week referral window. Earn up to 40% commission through incentive campaigns. Earn up to a $1 per click with TripAdvisor. Tripping.com - is the world's largest search engine for vacation and short-term rentals. With over 10 million properties in 150,000 destinations, Tripping.com gives you the widest selection of unique accommodations around the world. As a Tripping Affiliate, you will be able to offer the best deals on vacation rentals to your visitors. Conversion Point: Visitor must click on an affiliate link and be redirected to one of the supplier sites on Tripping International, Inc. to generate a paying lead ($0.20 per lead - Subject to change according to your website's performance). Vacalia.com - are a German Holiday Villa Rental Agency that works mainly in Mallorca and Costa Blanca and our main offices are in Mallorca. We sent you an offer to get a partnership with you and we'd really love you to accept it. From Vacalia.com we try to sell another way to travel. Big houses on fair prices perfect for families or big groups that'd like to enjoy the most authentical Mallorca. We chose Holiday Villas cause we care about our little island and, instad of keeping building new hotels and new properties, we'd rather talk to the locals which are glad to rent their properties to keep taking care of the island. Our properties can guarantee more space, more privacy, more freedom and are environmental-friendly. Vacalia is your choice in the Mediterranean Travel Market. The stenght of Vacalia’s brand is being local (knowing the market and the public). For many years, Vacalia’s founders have been working in Mallorca and Costa Blanca’s tourism, getting to know exactly what do people want and NEED. By joining Vacalia’s Affiliate Programme today, it’s your chance to benefit from our success and status as one of the best Holiday Rental’s brand in Mallorca and Costa Blanca. Earn up to 3% commission on every order you drive! 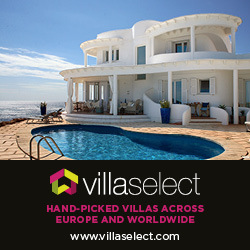 Villa Select - Hand-picked villas with pools for perfect holidays and memories to cherish for a lifetime! Founded in 1983, Villa Select is known for its unique and discerning selection of carefully hand-picked villas with individuality, character and style, from traditional rustic villas to high-tech modern luxury villas. Whatever your taste, you can be sure that every villa will offer the peace, privacy and relaxation you expect from a bespoke villa holiday. If you are looking for a bespoke Mediterranean, Caribbean, or South East Asia villa holiday for all the family, your holiday is in good hands when you choose to book with Villa Select. Book with confidence, Villa Select are member of ABTA which means you have the benefit of ABTA’s assistance and Code of Conduct. Many of the travel arrangements that we sell are protected in case of the financial failure of the travel company. Please ask us about the protection that applies to your booking. Commission = 5.25%; Average Order Value = £1250. Warner Breaks - Welcome to the world of Warner breaks, exclusively for adults. Warner Breaks offer inclusive half-board UK short breaks at stunning locations, with a wide range of activities, good food and live entertainment every night. The price of a break includes accommodation, breakfast and dinner everyday, a variety of leisure activities and nightly live entertainment. Earn 5% commission on sales. Warner Leisure Hotels - Within its portfolio Warner Leisure Hotels has 9 countryside hotels and 4 coastal resorts all in absolutely stunning locations. Some of their beautiful hotels are Grade I and II listed buildings while others are remarkable for their stunning settings. All are surrounded by immaculate gardens and have relaxed and informal ambience for their guests to enjoy. Warner Leisure Hotels has evolved a very distinctive product offering. The combination of a chain of hotels that offers half board short breaks together with live evening performances is unique, as well as the fact that our holidays are only for adults only. We also offer very unique ‘experience’ breaks. Their guests can choose from over 700 experiences to make their stay with Warner Leisure Hotels extra special, from a trip on the orient express to a hot air balloon or helicopter ride. Guests may want to try something new or indulge in a passion e.g. digital photography, painting, gardening, dancing, golf, sailing, fencing, all of this and more is available at Warner Leisure Hotels. Earn 5% commission on sales. Weekend in Italy - Founded in 1995, Weekend in Italy has grown to be the leading seller of tickets to Italy's museums and attractions, short tours, and special events through our website, www.weekendinitaly.com Headquartered in Italy, we are a family operation, and are unrivaled experts on the local scene. Our primary audience is the independent traveler, people who like to make their own travel arrangements. We also serve thousands of travel agents and travel professionals who resell our services to their clients. Frankly, we want you as an affiliate partner and are willing to go the extra mile to have you on board. Our 10% commission is sure to put money in your pocket. Our conversion rates are favorable to you, and your long cookie life assures you receive credit for sales from referrals who need a little time to shop and decide on what they want. Visitors from your website receive a warm welcome and resources not available anywhere else online. These include over 600 services aimed at people who like to make their own travel arrangements. Plus free city-by- city itineraries and invaluable tips that make for memorable vacations. Wyndham Hotel Group - is the world's largest and most diverse hotel company with approximately 7,150 hotels worldwide. With iconic brands and hotel choices in every category from upscale to economy, we offer not only the most hotel choices internationally but also exceptional customer service and great value. In the UK we operate two main brands; Ramada and Days Inn: Ramada is a hotel brand with nearly 900 properties globally; with over 170 of these being located in the UK, Continental Europe and the Middle East. No matter where you travel and the purpose for that travel, Ramada hotels offer an affordable, welcoming and restorative experience so that you can do your thing, and leave the rest to us! Days Inn offers the “best value” for price conscious leisure and business travellers. Guests will experience our refreshed image reflecting our new products and services. We now offer more than 800 franchised hotels worldwide on five continents! Wherever our guests travel they’ll always experience “The Best Value Under The Sun” at Days Inn. Look for the sunny new sign of value and see what the new day brings! Earn 3% commission on completed stays ordered through ramada.co.uk and daysinn.co.uk.